The last weeks have been full with appointments, things to do and just long days at the office. Last time fall had just started, now it feels like winter is just around the corner. 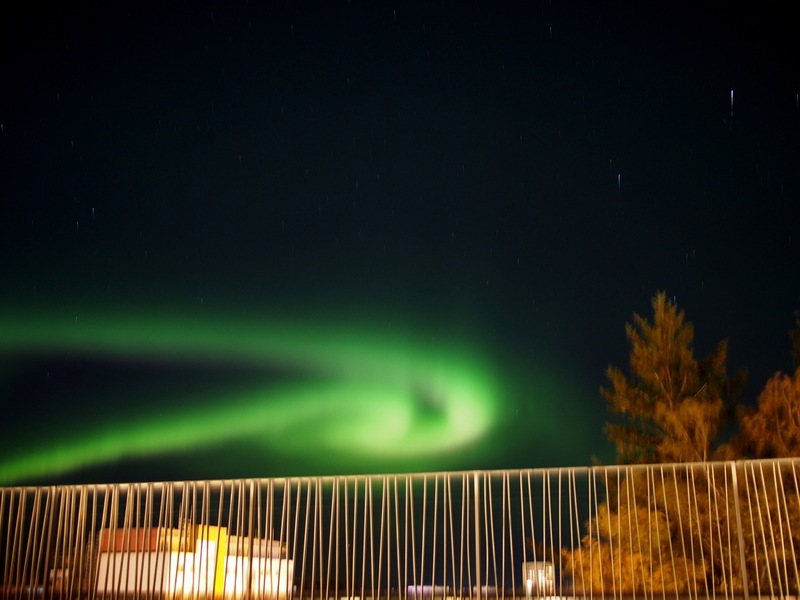 Last weekend was Halloween but at our boys kindergarten they had a troll fest instead of Halloween, since it’s not an original celebration in Norway. They had made troll tails at the kindergarten, we parents weren’t allowed to brush the hair nor to wash the face (trolls aren’t that clean). They sang troll songs, ate green cereal for lunch and for the afternoon snack I’d prepared scary spider cookies. The preparation of the cookies was a week-long project but I had a lot of fun and the kids were over the moon. 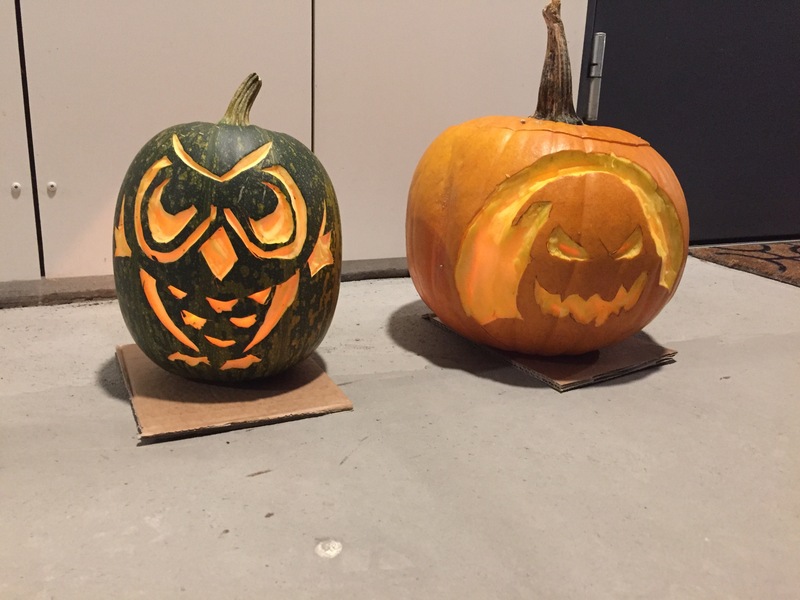 Our professional pumpkin carver M carved two pumpkins this year. We had a third one but he had just run out of carving energy. He found out it’s quite difficult to carve a dark-skinned pumpkin actually because you can’t see any marks on it, even if you cut into you can’t see where you just cut. But he managed to freehand the little owl anyway without a stencil or drawing on it. The pumpkin flesh was turned into a tasty warming pumpkin soup with ginger and coconut. 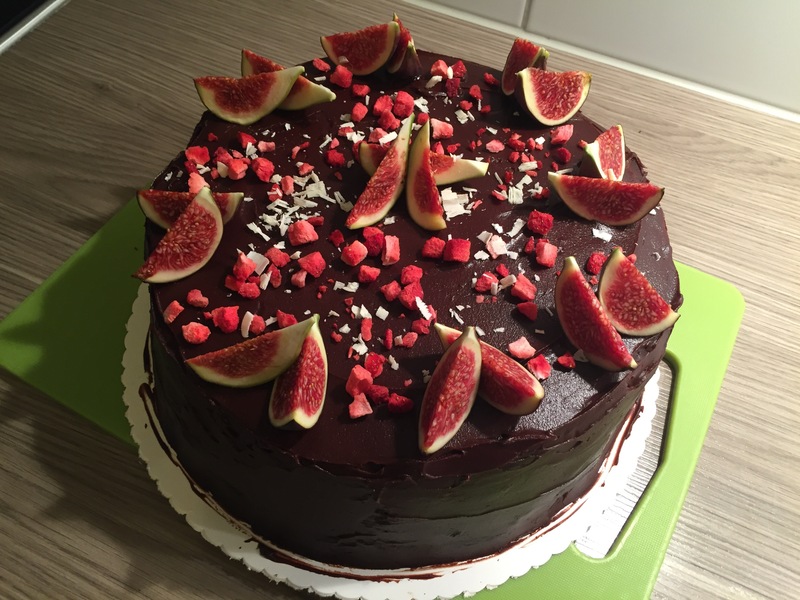 Very simple, pretty quick and sooo satisfying. Do you actually need something else than a warming soup when it’s cold and uncomfortable outside? And then there were those break-off rolls with oatmeal in the dough, fluffy, moist, delicious. The perfect combo for the pumpkin soup. One last thing: fruit and nut crumble. Here it’s called smuldre pai, so a crumble pie. This one is a fall pie with dates, apples, walnut and a good amount of cinnamon. East it slightly cooled with some vanilla ice cream or some yoghurt, just as you like it. You are going to like it, one way or another. 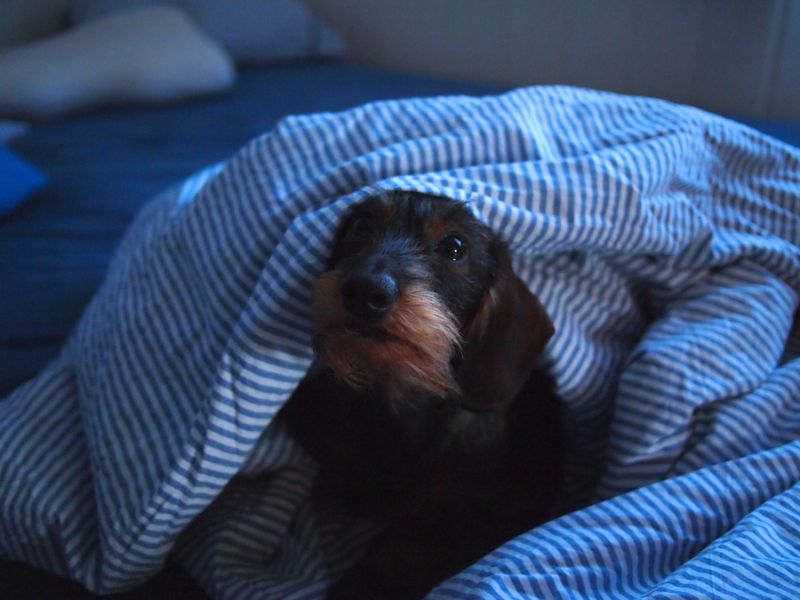 Our munchkin likes it for breakfast too. Next week we are going on vacation. One week on Tenerife. 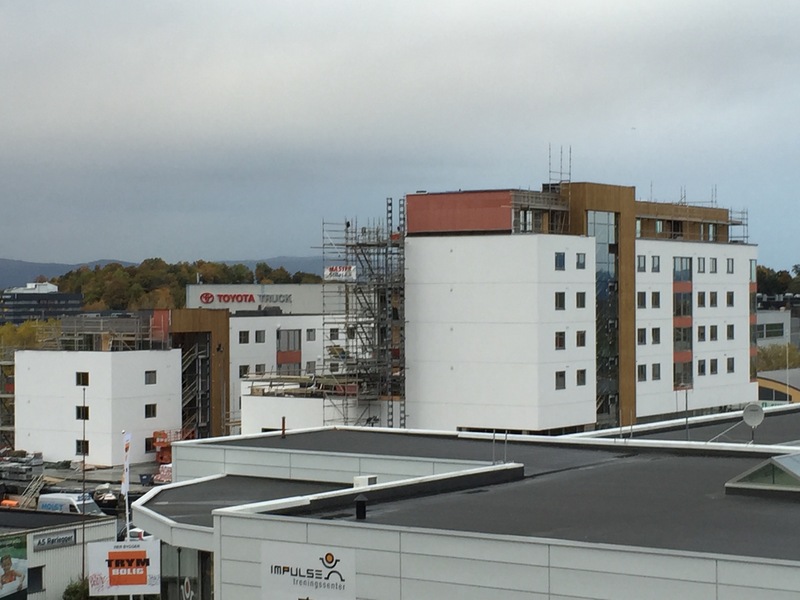 We are looking forward to some warmth and sunshine. 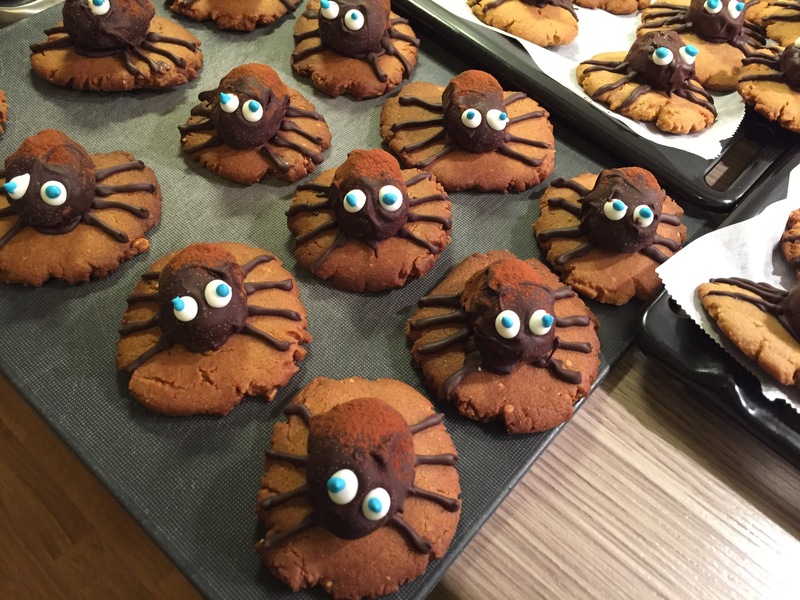 Spider cookies: I started with preparing the cookie dough a few days before I needed them. The next step was the forming of the bodies of the bodies of the spiders and to dip them good dark chocolate. The eyes for the spiders can be bought and made with royal icing. Cream the butter with the brown sugar and vanilla with paddle attachment of the kitchen machine. Make sure to scrape the sides of the bowl, that all the butter is well incorporated. Then beat in the eggs (or egg replacer), then the peanut butter. In another bowl mix the flour with the baking soda and salt. On low-speed add the flour mix and mix just until everything is well combined. Wrap the dough in clingfilm and refrigerate for at least a couple of hours or up to two days. When it’s time to bake, preheat the oven to 180C (360F) and fit your baking trays with parchment paper. Take a small amount of the dough e.g. 1tbsp, roll it shortly in your hands and form a flat disc out of it. Set on the baking tray. Continue with the remaining dough. Leave some space between each cookie. Bake for 15-18min. Let completely cool down before you store them in an airtight container. Mix the shredded dried coconut sip by sip with soy cream and sugar. Don’t add too much cream, just enough that everything is coated well with the cream. Let sit for about 30min, then form little oval balls. Set them on a tray and freeze them. Chop half of the chocolate and melt it in a water bather, then add the rest and stir until everything is melted. 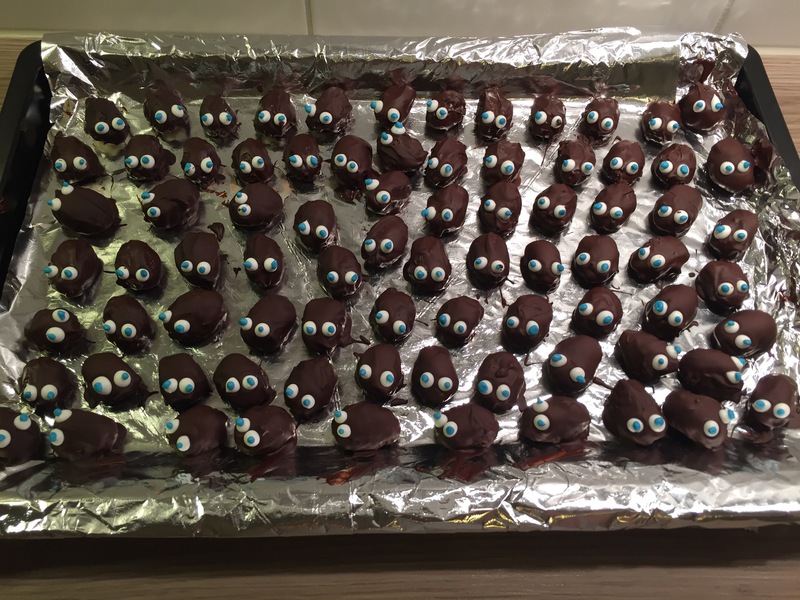 Dip every spider body in the chocolate and let them dry. Since the bodies are frozen, the drying of the chocolate happens fairly quick. Melt the chocolate in a water bath, fill it in a small bag where you cut a tiny edge off. Put on each cookie a little bit chocolate to glue the spider body on to it. Then make 8 small legs with the chocolate and glue the eyes onto the spiders. On top of those you don’t need anything else than fresh salted butter. The rolls are moist and keep well until the next day. Mix all the ingredients, except for salt and yeast, well in your kitchen machine and let sit for at least 30min. The dough is supposed to be pretty wet since the oatmeal is going to soak it up. After 30min, add the salt and yeast and knead the dough for about 10min. Then cover with clingfilm and let it sit for another 2 hours. 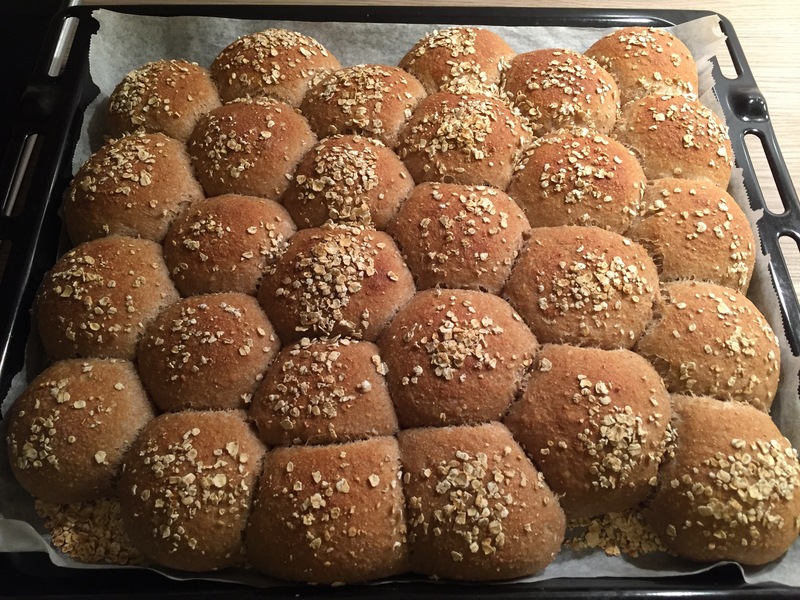 Form evenly sized buns out of the dough, roll each in some additional oats before you place them on a baking tray. Don’t set them too far apart since they are supposed to “grow” together and let them rise for about 2 hours. Preheat the oven to 230C (560F) and bake for 15/20min. Preheat the oven to 180C (360F). Place parchment paper in a ceramic baking dish. Mix the dates together with the walnuts in your kitchen blender until crumbly. Mix all the other ingredients plus the pulverized walnuts and dates in a big bowl of your kitchen machine, fitted with the paddle attachment. Peel and core the apples, cut each quarter into 4-6 thinner slices. 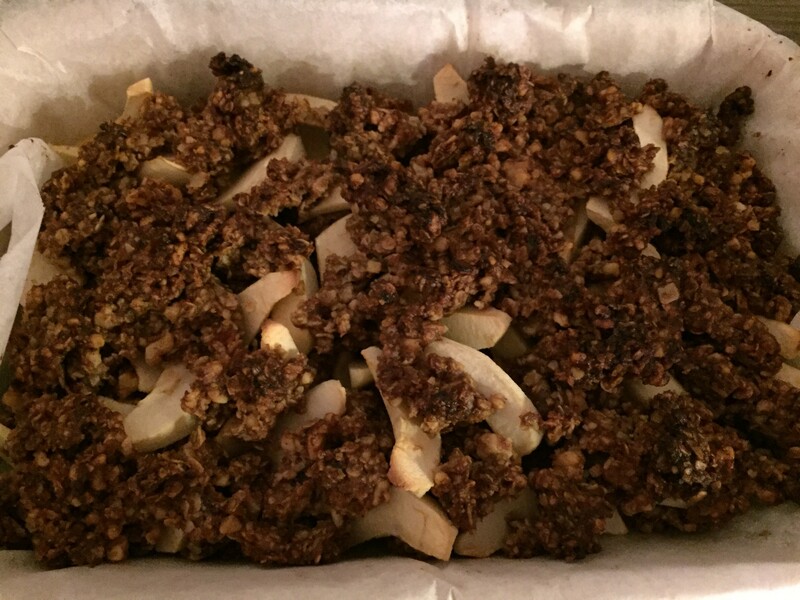 Place half of the apples on the bottom of the oven dish, add a layer of dough crumbs, followed by another layer of apple slices and finally topped with the remaining dough crumbs. Bake for 30-35min. Enjoy handwarm with some ice cream. 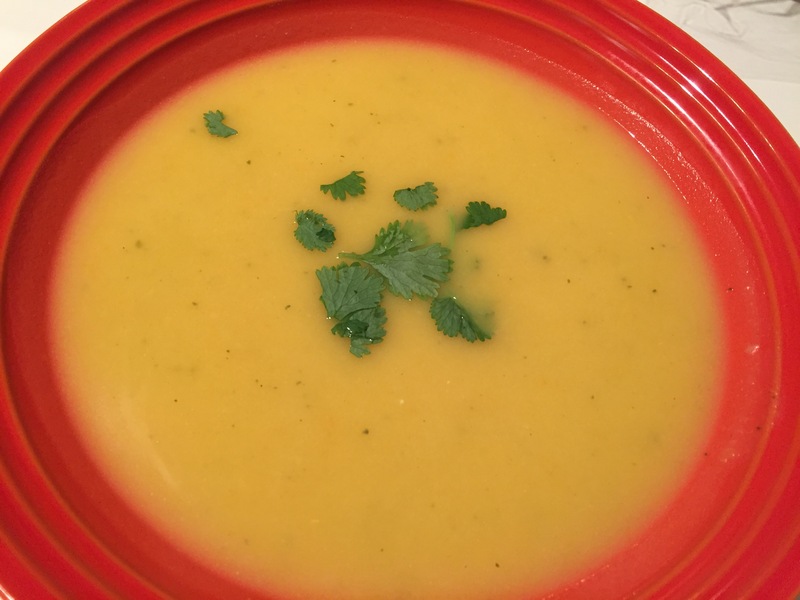 The last recipe for tonight is a warming and satisfying pumpkin soup. Depending on if you like to have a small zing or not, you adjust it to your taste. In a medium-sized pot fry the onions until they are done, but don’t brown them. Then add the grated ginger and garlic. Pour 1l of veggie broth or chicken broth on top. Add 800gr of raw, but cleaned pumpkin and 2-3 peeled carrots, cut into slices. Once the soup is done, about 30/40min, blend the soup with the immersion blender. Add the coconut milk and taste with a few squeezes of lime juice, salt, pepper and maybe chili if you like. Serve with freshly chopped coriander and fresh bread. 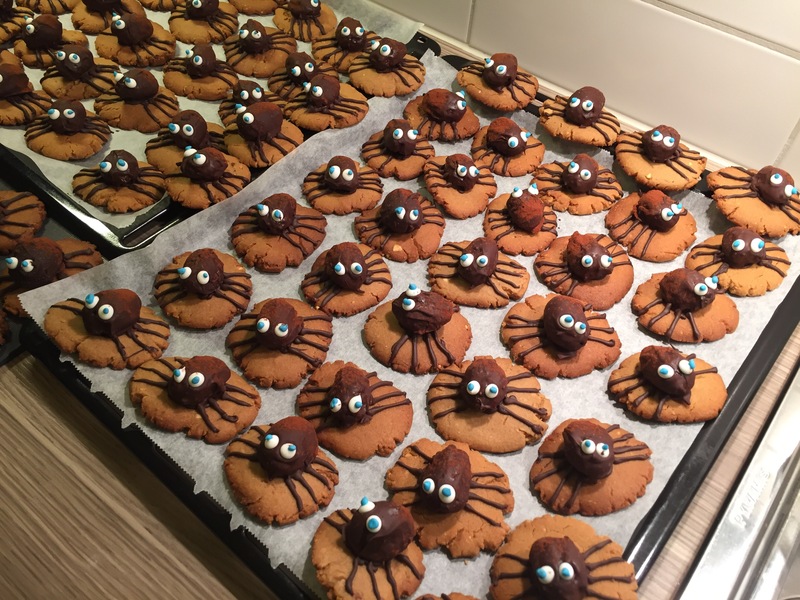 Those spider cookies are adorable — will have to remember your idea for next year!